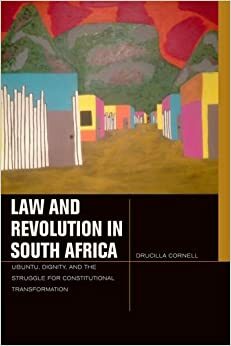 LAW AND REVOLUTION IN SOUTH AFRICA: UBUNTU, DIGNITY, AND THE STRUGGLE FOR CONSTITUTIONAL TRANSFORMATION, by Drucilla Cornell. New York: Fordham University Press. 2014. 224pp. Paperback $24.00. ISBN: 978-08232-57558-4. The likelihood of using the law to totally change a society will depend on the way the law is structured and applied in that particular society. Drucilla Cornell’s LAW AND REVOLUTION IN SOUTH AFRICA: UBUNTU, DIGNITY, AND THE STRUGGLE FOR CONSTITUTIONAL TRANSFORMATION examines the “ultimate failure” of societal change in post-Apartheid South Africa within the policies of the ANC (p. xi). South Africa, which Cornell discusses, gained democratic independence on April 27, 1994 with the “miraculous” collapse of the Apartheid regime. Along with its “revolutionary” transformation from the policy of racial discrimination not much is perhaps achieved looking at the question of “economic transition” under post-Apartheid ANC (p. 3). LAW AND REVOLUTION IN SOUTH AFRICA is divided into three parts; and in the book Cornell is seen fighting for the recognition of uBuntu. In LAW AND REVOLUTION IN SOUTH AFRICA the author leads us to find out whether the majority rule being spearheaded by the ANC has succeeded in line with its much touted current policy that is dictated by the “Washington Consensus” (p. 4). What needs to be seen is the way South Africa is governed. This is the reality in South Africa as the ANC has forsaken its revolutionary credentials and embraced democracy (p. 8). Is that working? Well, to break up the colonial structure does mean that its tentacles will naturally go. It sounds illusionary to think so when analysing an elite transition to power. Is it not the ANC that first voluntarily adopted in Africa the exploitative structural adjustment programme? Let me digress a little, I recently watched a documentary aired by Aljazeera network titled, “Miners Gunned Down.” The said documentary film is about South African miners who protested their poor work condition, low wages, among others. What happened to them? These hapless miners were gunned down in cold blood by their own brethren in the security service without recourse to the rule of law. One of the individuals interviewed tried to show that it was the fault of the defenceless miners, and that person was formally a union leader in the mining industry. He was presumably, before the unfortunate incidence, speaking on behalf of the miners. He changed tune and said so just because he now has managed to acquire shares in the mining company in question, and so anything goes no matter how ugly or illegal. There are numerous incidences like this in South Africa. The dilemma is seen from the eyes of those who thought law alone could revolutionize a society. Much truly needs to be decisively done to have equality entrenched in Africa. Thus, it is revolution, in my opinion, that will create a good law in a given society and not the other way round. This review evaluates how the book by Cornell elucidates some of the problems associated with the “new” South Africa. In Part I, “Should Critical Theory Review Revolution?” Cornell deals with the economic hegemony, which unfortunately is at the centre of affairs in South Africa [*2] (p. 22). This is the dilemma confronting many developing countries. It is like surviving between the devil and deep blue sea with nowhere to go. The neoliberal ideals are everywhere and, like elsewhere, South Africa is yet to answer the “question of what would constitute postapartheid development” (p. 23). Arguably democracy is the best form of government but not the kind of democracy that the majority suffers in terms of bad economic and administrative policies that are being reeled out. Regarding this key issue, one will agree with Cornell that “radical democracy” is what is needed in South Africa (p. 44). This is the only kind of democracy that will respect the votes of the people and establish justice and fairness. Democratization came with great hope, especially in Africa, but people are yet to see democracy’s much-talked-about benefits. Cornell’s assertion is relevant in the current circumstance where democracy is manipulated just to serve the narrowly predefined interest of global capitalism. Part II, “The Legal Challenge of uBuntu” tackles “criminal prosecution of those who participated in acts of violence” in terms of what happened under the white’s majority rule in South Africa (p. 47). This goes to the root of the so-called change in South Africa. Indeed it is true as Cornell has said that South Africa has learned “complex lessons” during its transition (p. 74). Despite the many atrocities committed under the ugly policies of apartheid, Desmond Tutu’s Truth and Reconciliation Committee came with a novelty as a way of healing the wounds, although not without much criticisms. Those who supported that type of reconciliation hailed it as African style of justice and that the “long disparaged African modes of life and intellectual heritage are themselves recognized as being of equal value” in the new transition (p. 90). Part III, “The Struggle over uBuntu” is thought-provoking. Cornell takes readers to understand that the possibility of real change in South Africa has been shattered and pluralism defeated “because the hegemony of the Washington Consensus seemingly eclipses all the big ideals that once claimed to stand in for the ideal of humanity” (p.107). Without a doubt, Cornell’s analysis is good here as it is very important “to recognize that there is African philosophy” which should have been the ANC’s guide but the government regrettably allowed the few business interests to corner its policies “by myopic imperial prejudice” which created the tumultuous economic situation in South Africa (p. 114). Well, the reality is that much needs to be done in contemporary South Africa instead of the claim that progress has been made. The most fascinating thing about LAW AND REVOLUTION IN SOUTH AFRICA is that the author has admitted herself that “the relation between law, revolution, and on-the-ground struggles for socialism is complex” (p. 184). Cornell’s definitive contribution is in helping us to understand South Africa as it is; as such the book is interesting. © Copyright 2016 by author Kawu Bala.